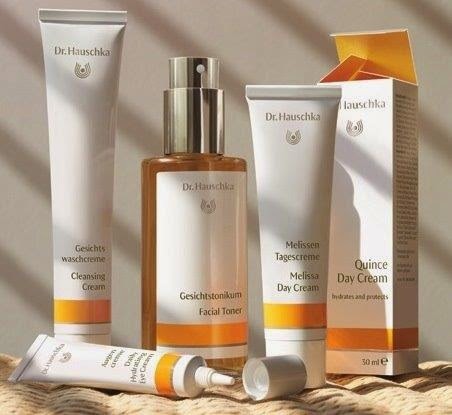 The Dr. Hauschka cleansing routine is extraordinary. Gently and deeply cleansing to leave skin feeling comfortable and free of congestion, with refined pores and sensitivity soothed. Many people think that moisturising is the most important aspect of skin care. But it is cleansing which is the most important. A gentle yet thorough cleanse allows the skin to perform its essential functions of protection, secretion, and production. This is the key to healthy radiant skin. The skin is slightly acidic, known as the 'acid–mantle' and the majority of cleansers are alkaline because they are easier to make that way. An alkaline cleanser disrupts the acid mantle leaving the skin feeling either tight and dry or sometimes it becomes more oily as it tried to correct itself. The best cleanser removes dirt, excess oil and secretions without disturbing the acid mantle in the process. Dr.Hauschka Cleansing Cream is extraordinary; gentle deep cleansing which leaves skin feeling soft and comfortable, it preserves the skins' natural hydrolipid layer, reduces congestion, refines the pores and soothes sensitive skin and inflammation. Extraordinary indeed! What is so special about Dr.Hauschka Cleansing Cream? The active ingredients are almond oil and almond meal. Once it has been mixed with water it forms an emulsion which collects the day's dirt, oil and secretions. Congestion and old skin cells are drawn out of the pores by the pressing and rolling movement, and are then washed off the skin with water. It has a grainy texture but is not a conventional exfoliant. We don't want to 'scrub' to remove skin cells off before they are ready. This only encourages sensitivity. The press and roll action gently removes skin cells only when they are ready to shed. Anything else I can do to help improve my skin? Warming the skin with a flannel or muslin cloth relaxes the pores for a deep cleanse. Adding a drop of Moor Lavender Calming Bath Essence* improves the quality of hard water and smells divine! You'll love this part of the cleanse. Soak the muslin in warm water, wring out and hold it to your face, neck and décolleté for a few seconds. If you prefer, splashing well with warm water is the next best method. Cooling the skin at the end of the cleanse tightens the pores and stimulates the lymphatic (drainage) system. And it feels wonderful! Moor Lavender Calming Bath Essence suits all skins. Lemon Lemongrass Vitalising Bath Essence helps reduce oiliness. Sage Purifying Bath Essence is excellent care for congestion and acne. The Dr.Hauschka guide to effective cleansing. Soothing Cleansing Milk is designed to remove makeup and for sensitive skin. Cleansing Cream is a gentle yet deeply acting skin cleanse suitable for all but the most sensitive skin. Mornings In the shower or basin. Warm your skin as above. Mix about 1/2cm of Cleansing Cream to a smooth paste in your palms by adding water and apply using a 'press and roll' motion, paying attention to any congested areas and around nose or chin. Use the whole hand - not just fingertips - for ease and efficiency. Pressing and rolling creates a gentle ‘suction’ which lifts dirt without rubbing. Work from top to bottom and inside to outside to support the internal processes. Remove the Cleansing Cream by splashing with warm water. Once it is thoroughly removed finish with a cool cloth to your face, neck and décolleté or splash with cool water. The result: healthy skin that is clean without being stripped. Follow with Facial Toner or Regenerating Serum to strengthen the skin and improve the skin's internal activity. Add moisturiser and eye care to hydrate and protect your skin during the day. Evenings It is important to remove your makeup before you cleanse. Use Soothing Cleansing Milk to remove makeup. Apply 1-2 pumps to damp cotton pads, hold against the eyes for a second or so and gently wipe away. No pulling and rubbing around the eyes! To remove foundation, first splash your face with warm water to soften the makeup, apply 1-2 pumps of cleansing milk with a press and roll action (see below) and splash off. Then cleanse the skin with Cleansing Cream as for mornings. Follow with Facial Toner or Regenerating Serum to strengthen the skin and improve the below-the-surface activity. And so to bed. It is best not to use moisturisers or creams in the evening because we want our skin to produce it's own moisture and not become dependent on an external supply. See 'When we are dreaming'. The whole routine takes less time to do that to read! It takes me perhaps 1-3 minutes depending on how rushed I am. It's time well spent! What do you love best about the Dr.Hauschka cleansing routine? If you have any questions please email me on grace@graceemmerson.com. I am always happy to help. I aim to live well - with fun and lightness of spirit. And with respect for the people around me and the world we live in. I'm a home bird who loves to travel. I am a wildish woman who loves silence and a party animal who adores the simplicity of a family meal. I am married to Rob and have two children and a grandson. Amy is 32 and Isaac is 14 and is endlessly entertaining! I choose to work in a way which has a simplicity and integrity, nourishing to us humans and also respectful to nature. 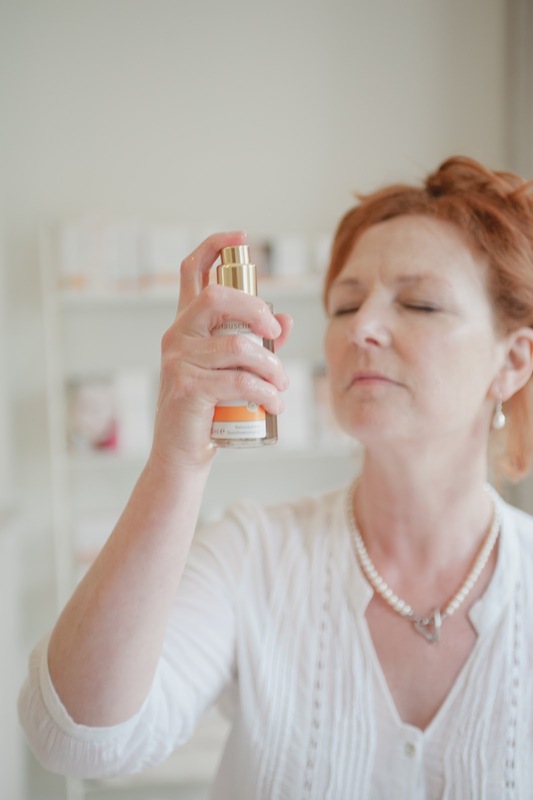 I love my work and am very thankful that I found Dr. Hauschka skin care and have been able to work with it to create a nurturing, enjoyable and rewarding way of earning a living. Why using a muslin cloth improves your cleansing routine. Dr.Hauschka Rose Day Cream - what provenance! Why choose Dr.Hauschka Night Serum?